Michael and Stephanie Askew purchased the Redstone Art Center in 2012. As artists and collectors, both wanted to continue working with fine artists in a unique location, and create an environment conducive to workshops, field trips, and special events celebrating art and music. Stephanie is the Creative Director of the gallery, and is a fine painter in both watercolor and oils, as well as an accomplished photographer. Her eye for quality and design in other works of art will add to the already outstanding collection of artists' work in the Redstone Art Center. She will be leading workshops, events, and the ongoing selection of original art to continue the legacy of the center over the years. Michael is both a photographer and wood worker, specializing in large format black and white photography, and various fine woodworking projects, including segmented turning, furniture, and pens. 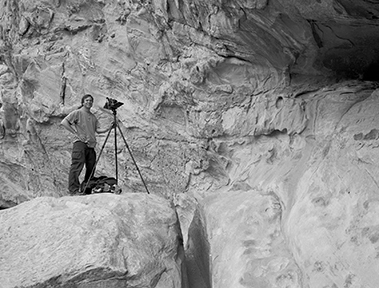 His award winning black and white photographs from numerous shows and exhibits are in private and corporate collections from Australia, the US, and Europe. The American Airlines Admirals' Club purchased 11 of Michael's photographs, which are on display in the San Diego Airport. Come visit with Michael and Stephanie in the gallery as they carry on the tradition of collecting fine art of all media, and continue to support numerous workshops, demonstrations, field trips, and other events in support of the community of Redstone and the surrounding area artists.